The new ENERG+ HEA-21533 water resistant wall mount infrared heater uses clean and odourless infrared technology so it is safe for family, friends and relatives. It is ideal for gazebos, patios, balconies, garage, etc. Very decorative, it blends beautifully into your environment. This stylish flame heater brings a new dimension to outdoor heating. It provides a uniquely visual flame while providing heat in every direction, and will be the focal point of any outdoor setting. This high quality unit features a tip over protection system for your safety. This Mocha Commercial Propane Patio Heater is the perfect way to extend your backyard entertaining season by providing a heating radius of up to 9 feet. This sturdy unit produces 46,000 BTU using a standard 20lb propane tank(not included) and has wheels for easy mobility. The stylish mocha colour perfectly accents and enhances your patio decor. This handsome CSA-approved patio heater includes a tip over protection safety feature. 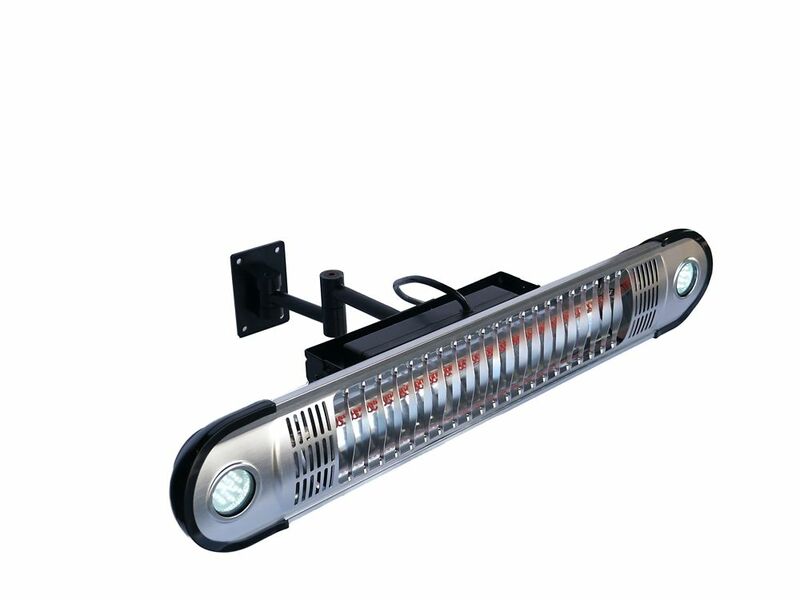 Wall Mounted Infrared Patio Heater with LED Lights The new ENERG+ HEA-21533 water resistant wall mount infrared heater uses clean and odourless infrared technology so it is safe for family, friends and relatives. It is ideal for gazebos, patios, balconies, garage, etc. Very decorative, it blends beautifully into your environment. Wall Mounted Infrared Patio Heater with LED Lights is rated 1.0 out of 5 by 1. Rated 1 out of 5 by Unhappy from If your looking for heat this isn’t the answer We purchased this to try and bring some warmth to our garage and unfortunetly it doesn’t work. The only way you can feel any heat is by sitting directly under it and the heat output is very minimal. Really unimpressed.